(Nanowerk News) Heat flow in atomically thin materials is strongly directional and now research from A*STAR indicates that this property could be employed to improve the performance of computer hard drives (International Communications in Heat and Mass Transfer, "Evaluation of thermal performance of graphene overcoat on multi-layered structure subject to laser heating"). 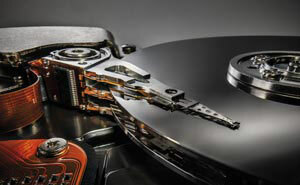 Two-dimensional materials could be incorporated in hard drives to improve performance. Hard drives store data by using magnetic fields to change the properties of a small section of a magnetically sensitive material. Decreasing the size of this section increases the drive’s capacity but also increases the size of the magnetic field required for switching. Furthermore, the minimum size of the magnetic field is limited by an effect known as superparamagnetism, in which the magnetic properties at the nanometer-scale can spontaneously change, losing any stored information. One approach to circumvent these problems is heat-assisted magnetic recording (HAMR). This method uses a laser beam to heat the storage medium to a temperature at which the magnetic field strength required for writing is lower and superparamagnetism is less prevalent. A drawback of HAMR is that the heating can also damage the protective overcoat layer that surrounds the magnetic film. This coating should be as thin as possible to allow the magnetic writing head to get close to the film, but thinner layers are more susceptible to temperature changes. As a possible solution, Shengkai Yu and his colleagues Peng Yu and Weidong Zhou from the A*STAR Data Storage Institute theoretically investigated the thermal performance of graphene; the world’s thinnest material. The researchers studied the heat flow induced by red laser light at different depths in a multilayer HAMR device made of graphene — 0.335 nanometers thick — on 12 nanometers of iron platinum, a magnetic material that naturally forms into nanoscale grains. Beneath these materials, their model included layers of titanium nitride, chromium ruthenium and tantalum all on a glass substrate. The next step for the team is to study the benefits of graphene for other magnetic memory materials.